rubybox has recently launched their first, exclusive, hand selected scent collection including four gorgeous 15ml eau de toilettes, packaged together in one beautiful gift box. Inspired by the extremities of our ever-changing moods, each scent was carefully, beautifully crafted to evoke feelings of Serenity, Desire, Rapture and Delirium. Serenity, an uplifting blend of top notes of ozone, melon, cucumber, grapefruit and magnolia, heart notes of tuberose, lily-of-the-valley, peach and rose and base notes of sandalwood, white woods and amber. Rapture, a thrilling composition of top notes of orange blossom, cedar and bluebells, heart notes of jasmine, patchouli, white rose and bamboo and base notes of cedar wood, honey, amber and musk. Delirium, a euphoric fusion of top notes of starfruit lotus flower, mandarin and honey, heart notes of saffron, jasmine, pear and peony and base notes of vanilla, musk and incense. Desire, a sultry melange of top notes of tangerine, black current, freesia and rosewood, heart notes of lilac, jasmine, peach, rose and geranium and base notes of patchouli, lemon tree wood, musks, amber and apricot. They sound divine. 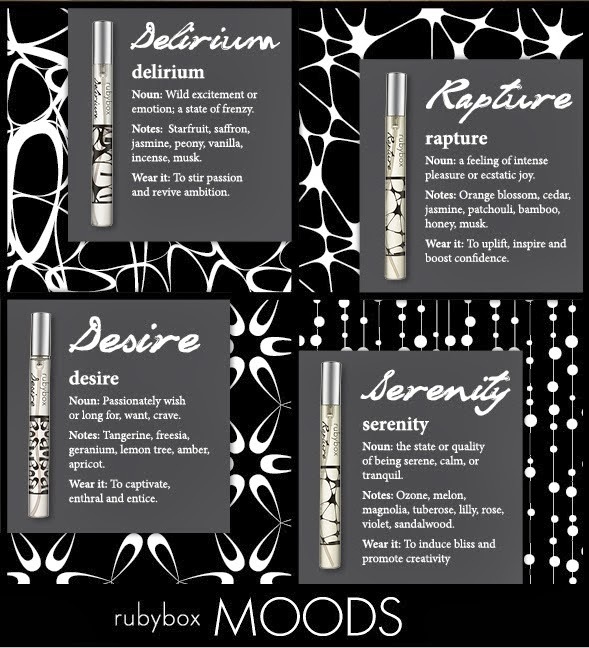 Delirium or Desire sound like my kind of scents!